Based on a horrifying true story of one of the Holocaust's worst Nazi war criminals, this novel combines a police procedural, a courtroom thriller, and a fast-paced war-time narrative. 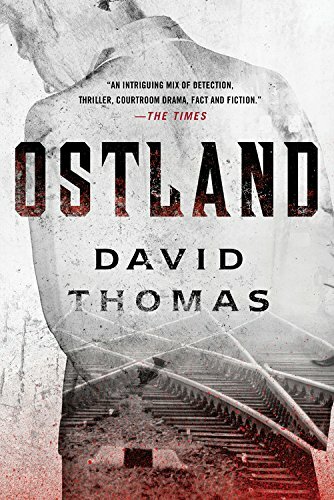 In Ostland David Thomas confronts the enigma of how the man who eliminated one of Germany's most notorious serial killers could go on to become a perpetrator of the most heinous crimes against humanity. In wartime Berlin the brilliant, idealistic young detective Georg Heuser joins the Murder Squad in the midst of the biggest manhunt the city has ever seen. A killer is slaughtering women on S-Bahn trains and leaving their battered bodies by the tracks. Heuser must confront evil eye-to-eye to track down the murderer. Soon after the case is solved, with the winds of world war stirring, Heuser is promoted by the SS and ultimately sent off to oversee the systematic murder of tens of thousands of Jews in the conquered region to the east the Nazis call Ostland. Nearly twenty years after the end of the war Heuser thinks his diabolical past has been forgotten, but an enterprising young lawyer, Paula Siebert, searching through Soviet archives, discovers evidence of Heuser's wartime crimes. Siebert is haunted by one question: how could a once decent man have become a sadistic monster? Tried in the early 1960s along with other ex-Nazi officers as a war criminal, the wily Heuser deploys his training as a lawyer and years as a police detective to try and distance himself from his co-conspirators and thereby escape justice. Ostland is a gripping detective thriller, a harrowing account of the Holocaust, and a thought-provoking examination of the human capacity for evil.